The Zero Carbon Footprint Home of the Future-available now! Simply put: the insulation system typically saves 20% + on heating and the sun space, with its heat transfer systems, another 30%( actual amount varies with design and location). This is your Basic Hybrid Home.Incorporating these simple and not costly design features alone already means your heating bill will be half of a standard home. Add a sufficient photovoltaic (PV) array and your home achieves a Net Zero rating i.e. a zero average over the course of the year. This is your Hybrid Home Zero Energy. With our large south facing roofs a larger PV array is possible. This gives one enough power for plug-in hybrid/electric cars. This your Hybrid Home Zero PLUS. This is your future proofed home: regardless of price increases in electricity or gasoline, your monthly energy costs remain fixed. FEDERAL: For houses built through 2016 the PV array qualifies for a 30% rollover income tax credit. On the 525 Pyramid Peak house this is around $8,000. One needs an income tax liability for this to work. This is the amount typically found on line 44 of one’s 1040 tax return. Rollover means, if it is not used up the first year, the balance remaining can be applied to the next year etc. until used up. Typically this translates to a substantial refund check. XCEL: Not shown in the above spreadsheet are still available Xcel rebates. As of March 1, 2015, there were still rebates paying the Owner of an 8.5 Kw PV array roughly $20/ mo. for 10 years. 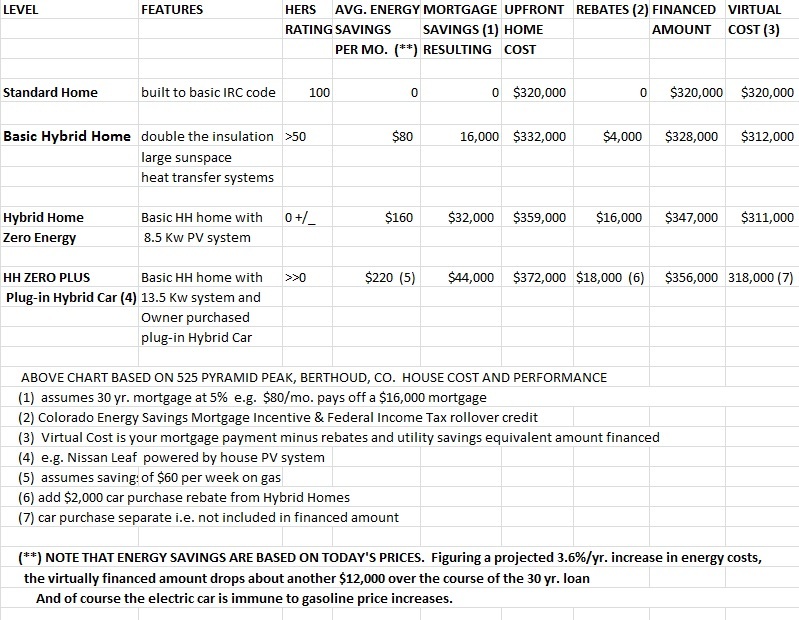 That’s another savings of $2,400 making the Hybrid Zero Energy Home the most affordable home over the long term. The investment benefit of this PV system exceeds by far the return on any standard investment, making the Zero Energy Home the smartest choice. And this is transferable if you do sell the home. PLUG-IN HYBRID CAR: If you add the extra PV’s (typically 4 Kw per car-assuming 80 miles/day use) and decide to purchase an electric or plug-in hybrid car, Hybrid Homes will give you $2,000 towards the purchase of a plug-in electric hybrid car. The purchase of such a car with that of the Zero Energy PLUS Home completes the vision and, as such, you become one of our preferred clients. And what is a zero gasoline cost over a 30 year period worth? Our guess: $60/wk x 52 x 30 = $93,600 and that is probably low! And then what is the comfort of a future proofed home worth? 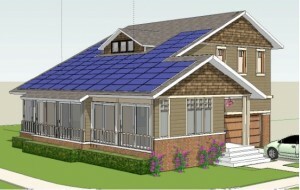 The Basic Hybrid Home qualifies for Energy Star Plus Rating or LEED Platinum Plus. 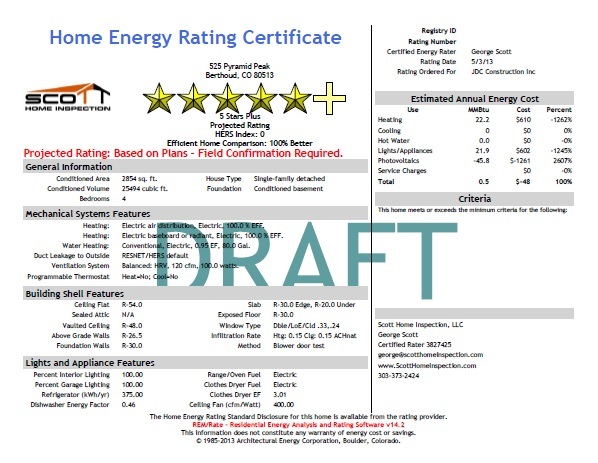 Our energy engineer is qualified to certify this house as Energy Star rated. And there are other Home Rating certifications out there but we exceed by far all criteria. To receive a Hybrid Home certification, very few houses would qualify!! 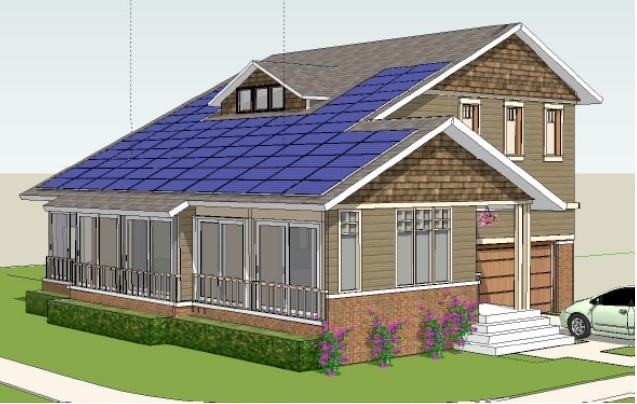 The projected Home Energy Rating for 525 Pyramid Peak with an 8.5 Kw PV system is Zero.